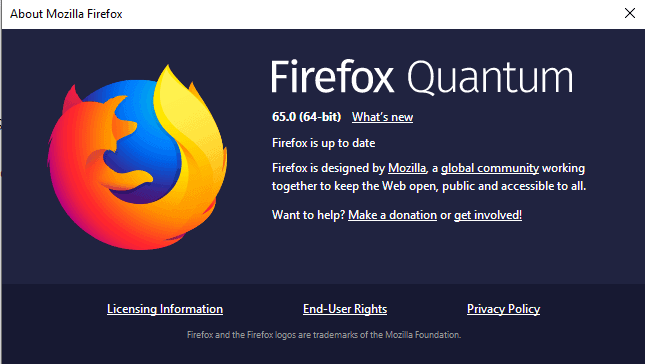 Mozilla Firefox 65.0's release date is January 29, 2019; this is the first major release of the web browser in 2019. 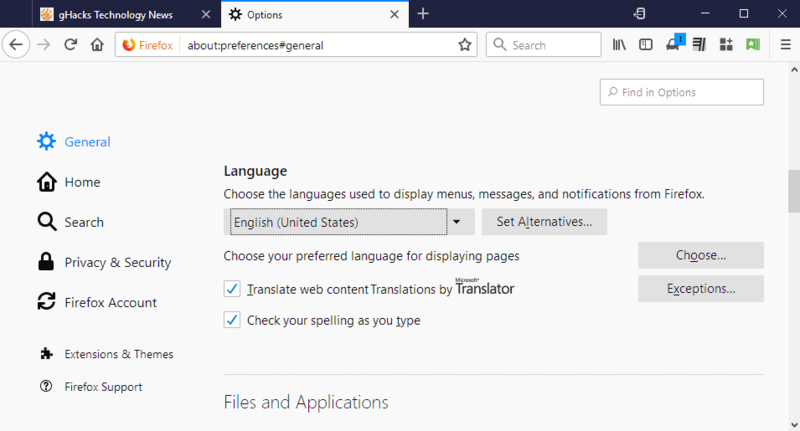 Firefox 65.0 is offered through the browser's automatic update system. Firefox checks for updates regularly by default and will download these automatically if discovered. 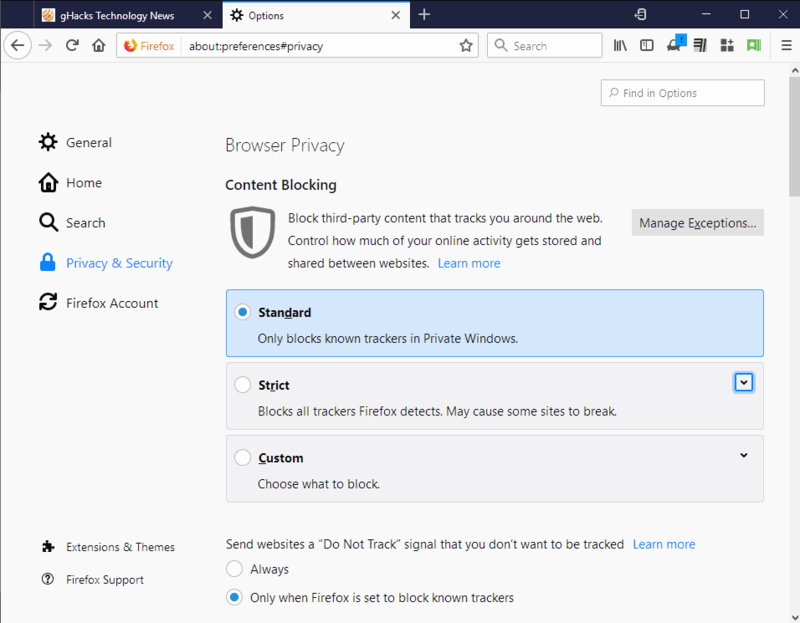 Mozilla improved the built-in tracking protection further. A click on the site information icon -- the i-icon displayed on the left of the web address -- highlights the level of content blocking and elements that Firefox detected on the site. The content blocking settings in the Firefox preferences have changed as well. You can open these settings manually by loading about:preferences#privacy in the browser's address bar or by following links in the site information panel. The about:performance page -- known as Firefox's Task Manager -- displays memory readings next to energy impact information in Firefox 65.0. Security improvements for Firefox on Mac OS X, Linux, and Android thanks to "stronger stack smashing protection". @daveb: I agree, “rapid release” schedules are terrible and I wish software would just stop with them. But this isn’t a Mozilla thing specifically, this is an industry-wide problem. Stick to the ESR. I couldn’t be happier. I figure they]ll iron out all of the changes by the next ESR, and then I’ll switch to that. At least you know what you have for eighteen months. Thanks for the article Martin, nice to read that Firefox is doing there best still to improve. Your writing about “Tracking Protection enhancements” and showing a pic of the “show site information” panel with there integrated the “two shoes” trackers section in the content blocking panel. But even when I try In not only strict mode, basic and custom to get the “two shoe trackers section sign” is not appearing for me at main FF65? Also now also Firefox 65 has a tracking function onboard is it wise to disable add-ons with this same function onboard of there add-on? And does the Firefox 65 has become again faster? Do you Martin ( Or anybody else who knows this) the answers? Tracking Protection focuses on known trackers and blocking some cookies. It is not equivalent to content blocking extensions. hi martin,can u do something about autoplaying video ads. i kept ublock off on ur blog for support ,others ads are ok,but video ads uses too much cpu on my old machine. The content blocking “feature” is breaking sites since they implemented it. Broken feature to be disabled as soon as update arrives. Just remembered I’ll have to do that again with Firefox features folder since the update always restores Firefox bloatware. Still no fixes for the dreadful performance on Macs, although I knew that as nightly isn’t any better. At this point I’m doubting that it will ever will be as it’s been bad since pre-Quantum. btw did you see some MS person’s tweets about Mozilla should be moving to Chromium? Is it me or does 65 seem faster than 64? How do I tell Firefox to stop changing colors based on Windows colors? I used the Dark mode in Firefox, but now, with v65, the title bar is Blue, like my Windows coloring… I don’t want that. I want Firefox all Black. Sadly, there is only one way, that I can see. You have to go to Windows 10 Settings and to the Colors tab. Scroll down until you see “Show accent color on the following surfaces” and uncheck “Title bars”. I don’t like this change, but I understand where it is coming from, especially with Firefox adapting to the Light or Dark theme of the OS. I would have kept the setting on, but this is irritating for my eyes on Firefox. I wished there was a way to disable it only in Firefox. ^ from something I found (I don’t have windows 10). See https://bugzilla.mozilla.org/show_bug.cgi?id=1504766 . This is by design. I guess OS settings override app settings in this regard. someone knows how to move tab bar below bookmark bar ? If you like your tabs below the bookmark toolbar like I do, DON’T DO THE UPDATE!!! Version 65 moves the tabs back to the top of the program window and at this point in time, there ISN’T any way to undo that brainiac move by the developers! AVOID THIS UPDATE LIKE THE PLAGUE! That is, unless you really LIKE having your tabs at the top of the window. I just updated to 65 and there’s a MAJOR annoyance now: every time I open a new tab and begin typing anything in the address bar, now some drop-down bars appear–a blue one with suggestions, and a row of icons of all of my installed search engines. How can I make this extreme distraction go away? In settings I have “Use the address bar for search…” disabled, of course, as always, and all the “search suggestions” stuff unchecked. I use a lot of bookmark keywords and search keywords, and typing in the address bar is something I do every few seconds or minutes hundreds of times a day. PLEASE tell me there’s a way to get rid of this annoying, distracting behavior every time I type in the URL box! I have the same complaint. The address bar drop down shows every single URL in history, it should only show the one the were typed in. If I want the history, I’ll go to history. @Anonymous: My address bar drop-down wasn’t showing the URL history when I typed–did you go through FF settings and make sure all the “suggestions” stuff is turned off? For me, Shiva’s tip to change that about:config pref to false, and to add that line to the userChrome.css file in the profile folder, worked a charm. Perhaps it will work for you, too! @Shiva: That worked perfectly! Thank you for helping me to “destroy” that annoyance. ;) You, and ghacks, have saved FF for me once again… Thank you! Did Mozilla fix the rel=noopener Bug in Firefox 65 as intended earlier? No it does not seem to be fixed in Firefox 65 Stable. Ever since 65 auto updated today. I cannot access other websites. All websites except other than mozilla.org get this message……. The owner of http://www.instagram.com has configured their website improperly. 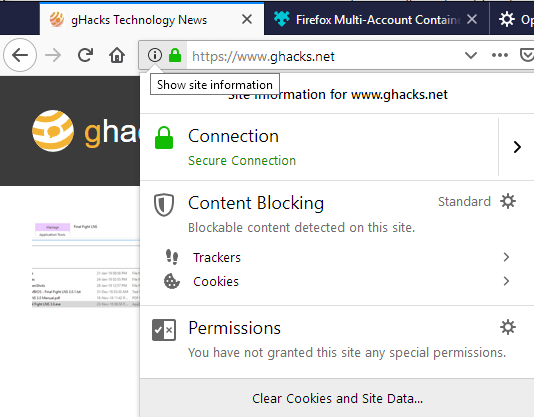 To protect your information from being stolen, Firefox has not connected to this website. Is there any idea how to fix this. I didn’t change anything on my system. Chrome and other browsers work fine. I think you are spot on in diagnosing the problem. I am rather frustrated for any average users that don’t have the skills to deal with the internals of their AV. I can imagine after an auto-update to Firefox some old ladies getting up and screaming when they can’t access their chocolate cookie recipe website. You think post update at least Firefox could have brought up a default web page saying if you have brand X AV you need to do Y. Whether Firefox or your brand name AV products they all need to learn to play together beforehand because most users don’t have the time to deal with troubleshooting these things. Thanks for your help. The light theme seems broken in 65.0. I can activate the theme, but no change. Annoying! True, among several other under-the-hood new/modified settings (accessible only via about:config). Does anyone know why FF seems to set a flash cookie (settings.sol) each time it’s opened? And if this can somehow be stopped? Because FF Quantum can’t run the Better Privacy add-on (which deleted flash cookies) I’ve been using the “Clear Flash Cookies” add-on. Recently I became curious if this add-on was working so I started using again a utility from 2014, Mixesoft’s “Flash Cookies Cleaner 1.2,” a tiny portable exe that detects and deletes flash cookies. I noticed that every time FF is opened, a flash cookie is created! This is with FF set to open with a blank page. I used a second flash cookie utility for a second opinion and it, too, indicates that a flash cookie is being created every time FF is opened. Any ideas about why this happens, and how to stop it? @Hy, no idea about why you get a Flash settings.sol cookie on Firefox start, but I’d rather think it’s set by an extension or plug-in and not by Firefox itself. I’ve uninstalled Flash system-wide for years now, if you accept my advice : remove Flash. The former works in real-time, the latter on user request. Flash, Flash cookies are system-wide but obviously you must have the Flash Firefox plug-in : try disabling it. Anyway Flash is bound to be forbidden on Firefox in 2020 I think : that garbage is not worth it, believe me. Tom, thanks very much for taking the time to answer, and correctly, it would seem! It never occurred to me that an add-on could be responsible. I restarted FF with add-ons disabled and voila! No flash cookie set upon opening. Then when I closed FF I noticed that a flash cookie was set! So then I changed the flash player plugin in FF from “ask to activate” to “never activate” and that took care of the flash cookie being set upon FF close. I re-opened FF with all add-ons enabled and flash plugin disabled, and no flash cookie, of course. Thanks for your help in getting this sorted! Right now I’m using 14 add-ons, with another five installed but disabled. Maybe later if I have time I’ll go through the troubleshooting one-by-one to see what add-on(s) are setting the flash cookie, out of curiosity. I removed flash player from my PC a few years ago, but then I think I ran into a number of things that would no longer work–can’t remember what right now, may have been some streaming sites for radio, sports, and movies–so I re-installed it. I’m a bit contrarian I guess when it comes to flash player: it’s never caused me any security problem over the many years I’ve used it, and it’s allowed me to enjoy many hours of radio, sports, and films over the years. But I think I may be keeping flash disabled in FF from now on, as these flash cookies are a tracker’s dream and a user’s privacy nightmare… Thanks again for the help! v65 showed up blanking all websites. Internal and external. Even in safe-mode. Had to wipe the profile directory to get anything to show up. Very annoying. Now I get to go back through all the settings and make all those changes made since 2016 again … somehow. And reloading the 5 addons isn’t fun either. Guess they know I’ll never use google-browsers and have me by the short-hairs. Odd thing is that another machine here with the same updates – both running Ubuntu openbox with 16.04 – worked without issues. The only different is that the machine running inside a virtual machine with QXL video drivers works and the machine running on real hardware didn’t. I suspect their attempt to use GPU accel is the issue, but who knows. And I always run firefox inside a mini-container for security reasons, firejail. It works with the stock settings inside the VM, but not at all on real hardware. Wish the Mozilla team follow the Hippocratic oath – first, do not harm. Tell us about the new features, but don’t enable them in the initial release. Get millions of testers first. And why must I sign up for a mozilla account to leave a bug report?